The future is here today for a select group of companies. It’s no longer a question of what to do, it’s a question of getting there. By looking at the characteristics of these select organizations we can gain insights into what we have to do to help our own organizations. One thing is clear however, we cannot try to do what other companies have done. No great organization was ever made by following another. However, there are ways of helping foster innovation, alignment, teamwork and strategic clarity. So the goal is not to copy another company that leads their field, but to learn from what they’ve done to get there. This article describes the goals and characteristics of the effective enterprise of the future. It then describes what it needs to do to achieve these goals. Here are the goals of the effective enterprise of the future. Here are the characteristics of the effective enterprise of the future. Teams with end-to-end responsibilities for products and services. These are one step beyond feature teams that can build aspects of an application. Rather these are full end-to-end teams (or small groups of teams) that actually can create a product, or enhancement to an existing product. They will still require support from shared services and ops, but functionality will be owned by them. Shared service teams and DevOps integrated into this network. Shared services are teams such as business intelligence that support multiple teams by providing cross-organization functionality. What does this involve? Here are some of the items that require focus, beyond what you might think about. Transformation is more than a mere adoption of good practices informed by effective principles. It requires changing the culture and management methods of an organization. Here are several of the steps involved. Create clarity on your target. Identify what are you currently doing that is getting in the way of that. Define the first thing(s) you are going to try in order to move in the direction of your target. Describe what you have learned. Transformation is most effective when led from the top. But regardless of where it is led from, it needs to attend to lowering the cost of delay of providing value. 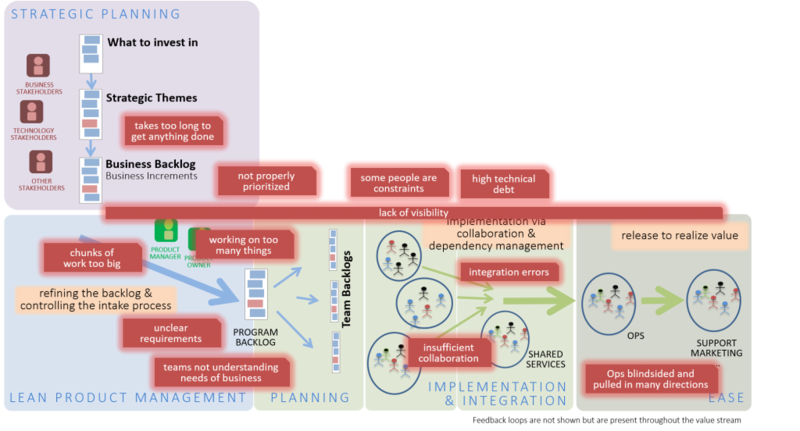 Transformation must also attend to the culture of the organization, something not being done by current Agile at Scale methods. In addition to Net Objectives, here are some other individuals or companies we believe are also working on the next wave. This does not imply that their approach is similar to ours but there thinking is impressive. Allen Holub. Integrates Agile and technical practices. Beyond Budgeting. The leader in continuous budgeting methods. Bob Marshall of Flowchain Sensei. Presents new ideas about organizational evolution. Dan North. Creator of Behavior-Driven Development, an out-of-the-box Lean thinker. Dave Snowden of Cognitive Edge. Creator of the Cynefin model which helps us understand the relationships between obvious, complicated, chaotic and complex. Don Reinertsen. The foremost thinking on flow. Evan Leybourn. One of the creators of the Business Agility Institute. Frode Odegard. Founder and CEO of the Post-Lean Institute. Joseph Flahiff. Coach, author of Being Agile in a Waterfall World, works with the business. Liz Keogh. Thought leader in BDD and Kanban (among other areas). Mik Kersten. Author with Tasktop. Hs approach is fully described in Project to Product. See chapters 4-5 for metrics. Dr. Robert Charette of Itabhi Corporation. Foremost risk management guru. This is not a complete list and no inference should be made by anyone not being on the list. Many people, such as David Bernstein, Llewellyn Falco, and Bob Martin, are not on the list only because they are more technically-oriented and I am discussing more process-oriented issues here. Here are some relevant articles to explore. Product and service development. Here are models and articles related to product and service development in the next wave. FLOW Framework. Fully described in Project to Product. See chapters 4-5 for metrics. Business Agility Institute. Evan Leybourn. Management. Here are models and articles related to management in the next wave. Here are models and articles related to management in the next wave. Intent-Based Learning by David Marquet. See Turn the Ship Around: A True Story of Turning Followers Into Leaders. If you want to have conversations about, this please join the True North Consortium Discussion Group on LinkedIn.